In the 60s and 70s, as Instant film photography got more and more popular, people started noticing the lack of film negatives. Without a negative, the image shot and instantly printed to Polaroid framed paper meant that was the only recording of the image. It wasn’t possible to run down to the photography store and have another couple copies made for friends and family. Unlike today’s digital images, the one print was all you got. Polaroid heard the noise and produced a couple models of the Polaroid Print Copier. Models 230 and 240. These where boxes a bit bigger than a shoe box with a dial, buttons, a lens, light and a power plug. Most folks that work with me in the Instant Photography world and stumble upon the Print Copier come to me to find out what type of film they need to buy. Actually, the hardware didn’t need film. 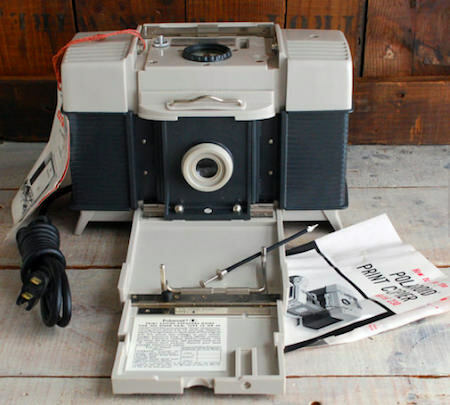 A person placed their photograph inside of the device, close the door (with a lens in it), then attached their Polaroid camera to shoot through the lens. A light inside illuminated the original print, with a few tries a person could get the setting right. Basically, it was a clean environment to take a picture of a picture. It did what people wanted though as it enabled a single Polaroid print to become multiple prints. When a person thinks about that history, The Impossible Project’s Instant Lab doesn’t seem as strange. 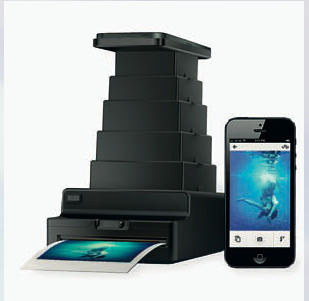 Of course, the company sells newly manufactured Polaroid style film so they would like us to jump on board and convert out iPhone images to Polaroid. For a person looking for the real effect of a older style photography without carrying an Instant (not exactly pocket cameras!) this is a nice solution. With the free app installed on the iPhone, images are shown on the screen that are taken and printed via the lower Instant film camera. Producing a new impression of what analog photography was without the need for filters and ‘fake’ framed prints. While the $299 US price tag may slow many people a bit, the fun of producing a whole different view of their iPhone photos will hit home with the fan as a must have. The Impossible Project iPhone app also allows the sharing and viewing of Instant Print images through their social network. Note: The original Polaroid Print Copier produced the original style small border framed prints while the new Impossible Project product produces the print with the larger white lower area more recognized as a ‘Polaroid’ trademark.